Friday, July 10, 2015 was a historic moment in the history of the United States of America. On Friday morning just after 10 a.m., the Confederate flag on South Carolina’s (SC) State House grounds was removed. It was an event that was surely overdue for decades. 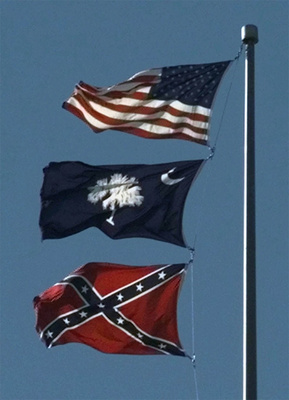 But thanks to the SC politicians, many of whom were overtly racists, if not covertly, and their supporters within the general population, this flag, which has been seen as a symbol of intolerance and racism by all African-Americans, had remained hoisted all these years, until it was brought down lately. Lind calls this process the "Southernization" of the American economy and says it's ultimately not about racism. "The ongoing power struggle between the local elites of the former Confederacy and their allies in other regions and the rest of the United States is not primarily about personal attitudes. It is about power and wealth," Lind wrote in an essay for Salon entitled, "The South is Holding America Hostage." The Confederacy may have surrendered on the battlefield in 1865, and its divisive flag brought down in South Carolina Statehouse nearly one and a half century later, but the battle over the Confederate flag is not over yet. Not only does Southernomics persist in other parts of the country as a viable economic model that deliberately keeps ordinary workers weak, dependent and scared but many Americans continue to revere the confederate flag as part of their heritage. Supporters embrace the battle flag as a reminder of ancestors who fought for the Confederacy or as an emblem of regional pride. Critics see it as a symbol of a defiant white supremacist society that fought to perpetuate slavery and segregation. Last Saturday, July 18, supporters of the Ku Klux Klan and the Black Panthers clashed outside the South Carolina Capitol in Columbia; five people were arrested and seven were taken to hospital for medical treatment. "The Confederate flag does not represent hate. A lot of Americans died for that flag," one member of the KKK reportedly told news reporters. The Columbia rally once again shows that the national push to pull the controversial icon from stores and public displays will continue to be met with determined resistance in some corners of the United States. Indeed, the battle continues, but why emphasize that the glass is half empty rather than it is half full?